New Zealand PM Jacinda Ardern gives birth to baby girl Becoming pregnant and bringing babies into the world is part of being a woman. 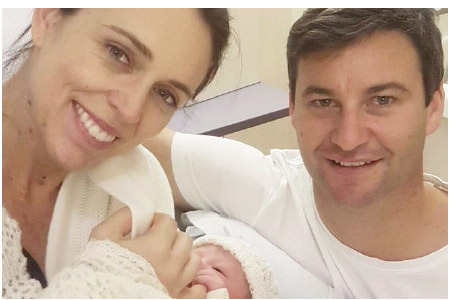 So why such a fuss when one Jacinda Ardern gave birth to a baby girl in the Auckland City Hospital, New Zealand, in June? The special thing about Ms Ardern, 37, becoming a mother is that she is only the second woman prime minister in modern history who has given birth to a child while still in office, the first being Pakistan's late prime minister Benazir Bhutto who had a daughter in January 1990. Ms Bhutto was assassinated in 2007. Appropriately, that girl, Bakhtawar Bhutto Zardari, now 28, tweeted her congratulations to the New Zealand prime minister after learning of the birth of the latter's baby, named Neve Te Aroha Ardern Gayford. During her election campaign last year there was a row when a television host quizzed Ms Ardern on the issue of her plans for a family, holding that voters had a right to know before they cast their ballots. She rejected the line of questioning as "unacceptable".. "Lots of people juggle a lot of things in their personal and private lives, and I'm not unusual in that. Plenty of women have multi-tasked before me, and I want to acknowledge that," Ms Ardern said while revealing the pregnancy in January. Multi-tasking comes naturally to women. But we are in times when the stay-at-home dads are becoming the order of the day. May their numbers grow!. The trend in favour of women's empowerment is gradually gaining strength. In May Senator Larissa Waters created news by becoming the first woman to bring her infant to the Australian federal parliament and breastfeeding the baby while taking part in the proceedings, a towel thrown over her shoulder. Many lauded the mother for what she did, but she said it was no big deal. "Breast-feeding is a normal and natural thing that women have been doing since time immemorial, and in that sense, it's quite strange to me that it caused such a sensation," Waters was reported to have said. In line with the changing times the Spanish and Italian legislatures have changed their rules and more may do so in future. lawmakers while breast-feeding her six-week-old daughter. "It's like any job," she said. "You've got to do what you've got to do." A rule change in the United States Senate has made it possible for Illinois Senator Tammy Duckworth to breast-feed on the Senate floor. It also allows women to breastfeed during votes. Duckworth, who gave birth to a baby girl this month, spearheaded the rule change and thanked her colleagues for "helping bring the Senate into the 21st century by recognizing that sometimes new parents also have responsibilities at work." What if some day a young mom turns up in the Indian parliament and insists on following the example of Ms Waters. What if more than one breast-feeding mom turn up in the Lok Sabha. More the merrier. Speaker Sumitra Mahajan will be left with the task of making special arrangements, which she'll be happy to do.. But, as things stand, political parties are not even agreed on the triple talaaq legislation. They are also divided on the matter of according women 33 per cent reservation in parliament, although a few political parties are headed by women. For all the strides taken by our women in various fields of activity, much remains to be done before India achieves gender equality.